A carpet bubble is an area in wall-to-wall carpet where the carpet lifts or rises over the subfloor and creates a hill or bump in the floor. You want your carpet to be flat across the entire room. What causes carpet bubbles to occur? One reason for carpet bubbling is improper installation. During new carpet cleaning appointments, we will often see instances of bubbling due to poor installation practices from the installer. You should monitor your carpet installer to ensure he is using powerful, professional equipment to stretch out and install the carpet. Another issue that might cause carpet to bubble is the quality of the pad beneath it. Be sure to invest in a quality carpet pad when purchasing new carpet. A low-quality pad increases the chances of bubbling over time. Sometimes carpet bubbling simply occurs because the pad and the carpet are worn down. Your carpet won’t last forever and once you see signs of bubbling and permanent wear and tear it might be time to consider purchasing new carpet for your home or business. The weather can also cause carpet bubbles to appear. If you are in the middle of a very humid time of year, you might see bubbling occur. The good news is that if the carpet bubbles due to humidity, there is a good chance it will flatten out when the weather cools down a bit. The last thing that might cause a carpet bubble is if the carpet gets too wet. You don’t want wet carpet. Your carpet can get soaked from water damage or from hiring a Fort Wayne carpet cleaner that uses high-pressure, high-moisture methods in their process. These methods are typical in steam cleaners in Fort Wayne. The carpet cleaner saturates the floor with water to rinse out their soap and cleaning chemicals and in turn leaves too much water in the carpet and the pad after the appointment. If carpet bubbles appear soon after hiring a carpet cleaning service, then you can assume that the company is to blame. You should hire a carpet cleaner that uses low-moisture techniques. 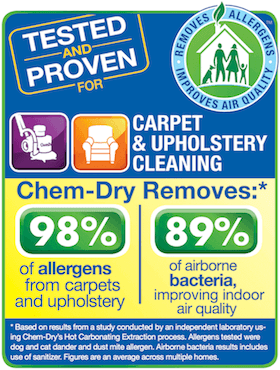 Chem-Dry of Fort Wayne uses one-fifth the amount of water that steam cleaning companies and contractors use. We won’t saturate your floor so there is no risk of carpet bubbling after. You can see there are several reasons that might cause a carpet bubble in your home. Proper ventilation and installation should help prevent bubbling or rippling carpet and hiring the right Fort Wayne carpet cleaning company.